Mozilla plans to integrate notifications to Firefox that inform users if add-ons have been detected that may slow it down. The feature, similar to what Microsoft integrated in its Internet Explorer browser years ago, monitors the performance of add-ons in the browser. If an add-on crosses a certain threshold, the warning is displayed in the Firefox interface. The warning notification reads "[Add-on Name] might be making [Firefox version] run slowly". Add-on name in this regard is the name of the add-on that is also displayed in Firefox's add-on manager while Firefox version lists the channel (e.g. Nightly). Disable add-on - This turns the add-on off and works similar to manually disabling the add-on in the browser's add-on manager. Ignore for now - Won't do anything for now. It is likely that warning messages will be displayed again at a later point in time. Ignore permanently - Don't display warnings anymore and don't do anything. I could not find information about the ignore period or the performance threshold that add-ons need to cross so that a warning is displayed in Firefox. Firefox seems to display lots of warnings right now which suggests that the threshold may need adjustment before the feature lands in the stable version of the browser. I for one received notifications for Adblock Plus, Nightly and Multi Links in a short period of time. If you have installed many add-ons, you may receive lots of warnings. One issue here is that there is no "turn off" option available right now. Three new preferences are provided that you can use to customize the feature.Note: there is no official documentation yet that describe the preferences. The descriptions are best guesses as to what they do. browser.addon-watch.interval - Seems to define the interval in which add-ons are checked. browser.addon-watch.percentage-limit - Seems to define the load threshold for warnings to be displayed. browser.addon-watch.ignore - This lists the add-ons that are ignored by the feature. It takes extension names (those listed in the Firefox profile folder under extensions) as values. 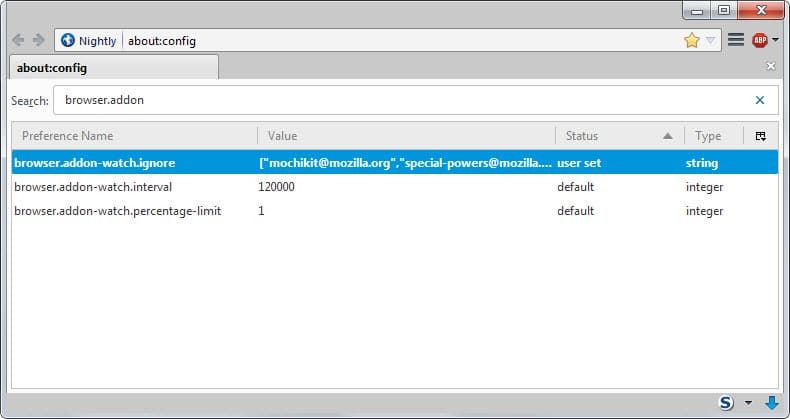 You will notice two default ignore items: mochikit@mozilla.org and special-powers@mozilla.org. So, as a workaround: if you don't want these warnings to be displayed to you, change the threshold to a higher value, e.g. 10 or 25. It needs to be noted that the feature has just launched in Nightly versions of Firefox and that it will take several release cycles before it lands in Firefox Stable. This makes it likely that it will be adjusted before that happens. Considering that Firefox users install more add-ons than Internet Explorer users on average, at least that's what I assume taking into account that there are not that many add-ons for IE available, the warnings are displayed more often to users of the browser. If you happen to run lots of add-ons, you may be bombarded with notifications in the beginning. Firefox 38 monitors add-on performance and displays warning notifications in the browser when add-ons require too much processing power. Interesting. Thanks for posting the links, very helpful. I don’t think such detection gives great insight into addons working in single-process mode, but this is mainly intended for e10s as this unsafe CPOW usage causes notable slow downs for it. An addon might have other slowdowns that aren’t being measured, this is just looking at the main thing that’s hurting e10s use with addons. Q: Is CPOW usage being used to drive the “Addon might be making nightly run slowly” popup? A: No, that’s driven by time spent in a compartment. Addons might slow down my browser? Really? How unexpected! Guess you have to be a really die hard Firefox fanboy to find this feature awesome. One could just use the brain instead but somehow that is unpopular these days. You don’t have to study mathematics to solve that equation. And then, it doesn’t help you a damn thing if it’s the addon you need. My brain tells me that in his case, he uses FF with a given set of addon, everything’s fine, he adds a new one, then it’s slow, and so, well, guess which addon it may be in its list ? The last one, maybe ! Sure…. you have to use your brain but you would have to experiment to find out just which add-on or add-ons are slowing down your FF. This feature will do just that and notify what add-ons are slowing your FF. In your case, don’t use it and “burn your brain” figuring out what is slowing your FF. Have fun and enjoy……. Regardless of what add-on is slowing you down, give the 64b versions a try. After switching to them, it was a noticeable difference between load times. The 32b version with my 20+ add-ons, takes 10-15 second on startup. The 64b version (Nightly Dev 64b) with the same 20+ add-ons (none were disabled when I made the switch) now only takes 1-5 seconds. Simple way to save memory. uBlock does the same thing as Adblock Plus but only uses about 1/6 of the memory. Also not as many sites have blocked it yet. The warnings are not really about memory usage though but uBlock is definitely the better choice in regards to performance. I tried to switch to ublock, but I could not import personal filters. That is a deal breakers. ublock has options to use your own filters and rules. You may want to give it a second look. Thks for the article and the links. I used to use Adblock and, later, AdBlockPlus for installs where performance wasn’t crucial. Of course, back then it performed fairly well anyway. For awhile now all I really use is NoScript to block most 3rd-party scripts–not in order to block ads, but that is something of a “side” benefit; it makes Firefox perform better in more than one way w/o being a major drain on performance itself. Ad blocking and privacy protection add-ons do seem to have their issues with performance–pretty much expected, but a necessary “evil”? it is so as firefox is made to be slow with addons not the opposite, it can’t be opposite.. the owners should change entire team that works on firefox now, thats the problem..